More than 100 people attend the Press Herald event. 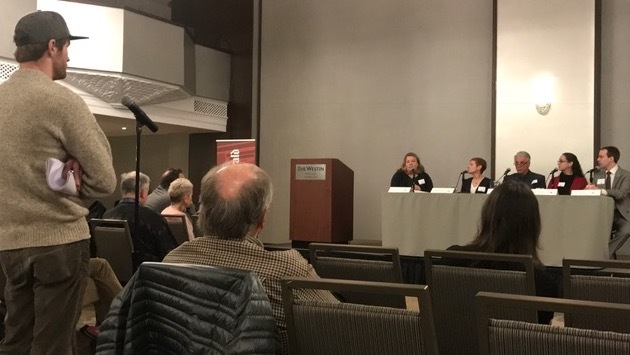 More than 100 people interested in the business of legal cannabis attended a Press Herald event convened to help those budding entrepreneurs understand the state’s medical marijuana industry. Providing expert advice were panelists Patricia Rosi, CEO of the Wellness Connection, a network of marijuana dispensaries; Peter Mourmouras, founder of Tax Doctor in Old Orchard Beach, an accountant who provides services to about 200 businesses involved in the legal cannabis industry; Catherine Lewis, board chair of the Medical Marijuana Caregivers of Maine; and Sen. Eric Brakey, chair of the legislative committee crafting reforms in the state’s medical marijuana industry. The discussion was moderated by Penelope Overton, the Press Herald reporter who covers marijuana news. • All the panelists agree there is enormous opportunity for growth within the medical marijuana industry in Maine, especially along its supply chain. While most of the discussion centers on dispensaries and caregivers, Mourmouras noted there is a growing need for other skilled professionals, including HVAC technicians, security, real estate agents, lawyers and lobbyists, accountants, consultants, software designers, packaging managers and more. • Lewis said her organization has seen increasing interest from retirees who are growing medical marijuana and becoming caregivers. She cautioned that costs can outweigh returns in the early years, but she has seen annual incomes of between $25,000 and $65,000 for those who have a good business plan and have stuck with it. • Brakey said the state has to focus on changes that promote access. His committee has proposed sweeping reforms that remove barriers, such as a cap on how many employees can be hired by a caregiver, and allowing business expenses from marijuana operations to be deducted on state taxes. • Lewis said prospective cannabis entrepreneurs should be wary of offers of financing from out-of-state interests. She said early on, she was approached by an out-of-state investor offering $500,000 to help her launch her grow operation. But in exchange, the investor expected to keep 75 percent of the returns. • For people interested in getting into the industry, Rosi advised three things: have more capital than you think you’ll need; have a well-thought out business plan; and be resilient, because changes come at a fast and furious pace. “It’s not for the faint of heart,” she said.